Calvinball is a game the pair play together that has simple rules but produces a confusing result. 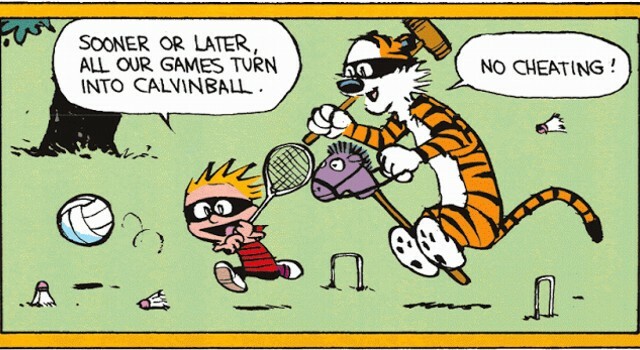 The only permanent rule of Calvinball is that you can’t play it the same way twice. Other than that, Calvin and Hobbes make up all the other rules on the fly as they need them in order to win at that moment. The more rules they make though, the harder the game becomes to play. If you’ve ever read an article that has made a broad generalized claim about all of a particular “type” of trust, that article was simplifying things. The truth is, I can make my trust do whatever I want it to do. Like Hobbes, I can make my heirs sing the “I’m Very Sorry” song to receive disbursements. Or I could make a trust now that distributes its funds to the first person to ask for them. If I write it, my trustee is obligated by his or her fiduciary duty to honor it. That being said, the government is a referee in this game. If I write something too out there, like “No taxes shall be owed or gathered on any of this money,” they’ll jump in and say, “You can’t say that!” and take their taxes anyway. But just like it takes a lot to phase Calvin’s mom, there aren’t many things the government overrules. If I make my trust too confusing, you might need a lawyer to step in and help decipher what I was trying to do. For example, Where exactly is the boundary of the invisible zone? may need legal interpretation. This is where types of trusts are really invented. Lawyers come up with clever and confusing strategies and then they name them. “Asset Protection Trusts” are trusts skirting around the rules of lawsuits and asset ownership. “IRA Distribution Trusts” or “Look-Through Trusts” are dancing between the rules of RMD stretch provisions. A “Crummey trust” is named after the first person to win against the IRS after using a trust to dodge the gift and estate tax. These names are short-hands for Calvinball-like trust strategies. Estate planning attorneys using and writing about these trust “types” is like them saying “weren’t we clever when we came up with this rule.” That being said, the IRS has recognized a few types into the “canon” of trust law. So if you feel like it is hard to wrap your mind around the complexities of trusts, don’t worry; it is. In fact, it is a task that likely cannot be done. There will always be another clever idea from a another clever estate planning attorney adding another rule to the game of Calvinball. Furthermore, your trust or the trust you are helping to manage is likely unlike any other trust out there. It has its own rules and complexities. It is its own game of Calvinball. That is why when we take Trust assets under our management, the first thing we ask for is the Trust document. It is the only way we can know the rules of the game and help advise you on how to manage those assets. Image an excerpt from Calvin and Hobbes #67.